A child fears the loss of his grandmother’s love. Young barn owl Ollie gets a big surprise when Grandma introduces him to his new baby cousin, Lily. An even bigger—and unhappier—surprise is that Grandma seemingly loves the baby more and pays her lots more attention. Lily’s charming baby antics and attempts to play don’t persuade Ollie that she’s any fun. When Grandma continues to gush over her, cooing endearments Ollie thinks belong only to him, he’s stricken with jealousy at first. When snack time brings forth only half a cookie for each grandkid, that does it: Ollie breaks down in tears, convinced he doesn’t possess Grandma’s whole heart any longer. Grandma plausibly explains the meager portion. More importantly, she earnestly explains that a grandmother’s love never dims, helping Ollie feel better about himself and the infant. Youngsters dealing with a new sibling or new relative who appears to dominate the family landscape will feel Ollie’s pain here. 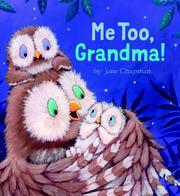 They will be heartened by the tender, reassuring message that “When a new baby comes along, a grandma grows new love!” The endearing illustrations, rendered in soft browns, white, teal, and purple and featuring a lively trio of winsome, fluffy, and very expressive owls, are delightful and will capture readers’ attention and hearts.